Perfect charter for any experience level! This fishing charter is fully customizable. Up to 12 anglers fit with space to spare. No matter your experience level, the Captain and Crew welcome all and will provide a top notch charter for an exceptional fishing experience. On this charter, and according to fishing season, we'll target all fish ranging from bonefish, snook, tarpon, shark, grouper, mahi, billfish, mackerel, tuna, snapper, wahoo, marlin, etc. Anglers are able to keep your catch if you desire to do so. Also, you're able to set up a dinner reservation and have your catch cooked while it's the freshest, directly through your professional and friendly captain. We can arrange for your catch to be given to a family in need to help out the less fortunate if you'd like to donate it. 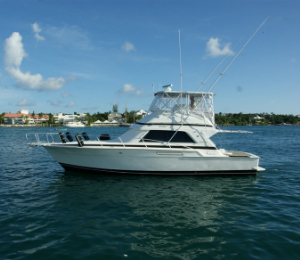 Not only is this an exceptional fishing charter, but it is a fun charter! If time permits, snorkeling and spearfishing are available. You can even book this charter as a complete leisure trip for finding an amazing beach to get away from the crowds and just go and relax, or explore areas that other boats aren't hitting. Larger groups can be accomodated for leisure charters. Leisure charters will allow for snorkeling, beaching, exploring out islands, etc. I have been to the Bahamas many times, but Strike Again - 43' Bertram Sport is one of my favorite trips! It includes everything that everyone should do here. As a Bahamas veteran, I can say only the best about this experience!